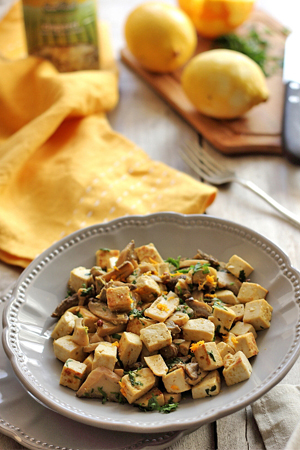 In the beginning, chop the tofu into cubes of 1 cm. In another bowl, stir the orange juice, the lemon crust, the mustard and the peppercorns. Then add the tofu cubes, stir well, cover the bowl with an alimentary plastic film and put it in the fridge for about 2 hours. Draw off the mushrooms and put them into a frying pan. Fry them for 1-2 min, then add one olive oil spoon, salt, black fresh ground pepper and let them to cook for 1-2 min. Take care to stir. Then take the mushrooms, put them into a soup plate and cover it with a cover. In the same frying pan add the tofu pieces and two spoons of olive oil. Cook them for 2-3 min until it gets an even colour. Add the mushrooms, thee parsley and tofu. Stir it for 1 min until the tofu becomes a sauce. Serve the salad hot with some orange crust and fresh chopped parsley.